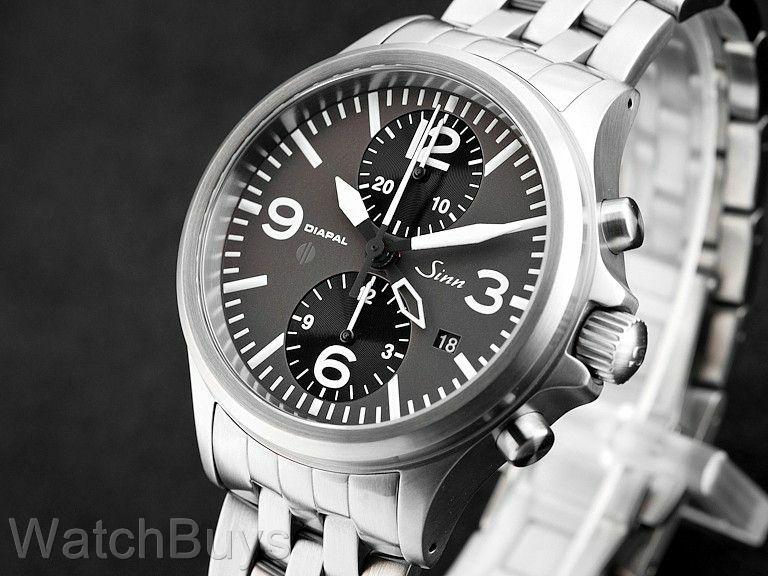 The Sinn 756 UTC DIAPAL chronograph is the first watch in their product line to be fitted with this DIAPAL escapement. This watch features "Tegiment" technology. Standard steel used by most watch companies has a hardness of between 200 and 240 HV (Hardness Vickers is a common scale used to measure material hardness). The Tegiment layer has a hardness of 1,200 Vickers which is five times harder than standard steel. Satin-brushed stainless steel case with solid back. Dial is anthracite with black sub-dials, Arabic numerals and offset date display at 4. We have to say this is one of the most striking dials we have ever seen on a watch. The design and layout of this watch make it extremely easy to read in virtually all light conditions. Sapphire crystal with luminous hands and hour markers. The UTC feature or second time zone is indicated by an additional hour hand (pointing to 7 in our photograph). Watch is water resistant to 20 ATM. Verified Owner Comments: I have had the watch for a few weeks, keeping great time, nicely weighted, band adjustment was easy and comes with the necessary adjustment tools in the case. I was worried the profile of the watch would sit a little high on my wrist based on pictures on line, but this is not an issue. The watch has taken a few minor knocks during the day to day use and shows no scratches or marks, so the tegimented finish and sapphire crystal are functioning appropriately. Verified Owner Comments: Love mine! Many thanks to the guys for a smooth purchase process! Verified Owner Comments: Most beautiful watch I have ever seen. Verified Owner Comments: The best watch I've ever owned. Beautiful, fits nicely and very, very accurate.